When I first met InDesign, in 2000, I (like many users then and since) thought maybe URL-based assets would be a feature that was already part of this then-new product: wouldn't it be cool to work with web-based assets? But no, it wasn't part of the product, and such a feature wasn't necessarily essential to getting work done. With InDesign and InDesign Server, by default, you just have to make sure things are in the right place on the file system. WebDAV offers a sort of linking to Web-based assets, but it is typically clunky and for the most part we put effort into moving files around and validating that they are in the right place when we automate InDesign Server. In February, 2009 I went to cold New York City to attend the "Adobe InDesign and InDesign CS4 SDK Post-launch Developer Briefing." I was tired and almost slept, but I woke up when they said how the linking architecture had been fundamentally rewritten underneath, to support URI-based linking, two-way linking, and generally what looked like anything one would want to do with linking. I asked, immediately, "can this be scripted?" and was quite disappointed to find out that it not only required a plug-in to leverage any of this power, but there was quite a bit left to developers to create what one would imagine as a basic use of URI-based linking. Still, I never forgot this, and recently we finally had a chance to build our own plug-in to exploit this underlying capability. After taking some time to figure out how to do this right at a low level, and thanks to some truly expert developers, and the fact that we were able to hire Michael Easter, it works! Connecting InDesign to URL-based assets! This capability compliments and enhances the CS Extensions that came out with InDesign CS5. 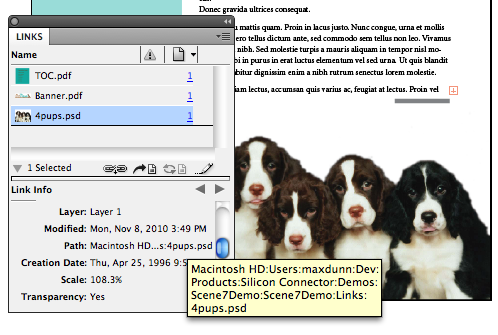 We now have what we naively expected out of InDesign 1.0. Better late than never! Seeing the range of possibilities and finding different visions and functional requirements of different DAM vendors and developers/users, I see now why Adobe left this capability so far under the hood. There is not a single generic approach that would work for everyone.